It has been ages since I blogged. There’s plenty I could talk about: TV shows that I have enjoyed lately, the Ontario provincial election and voting by special ballot, my impending return home … and I may indeed get around to blogging about these. 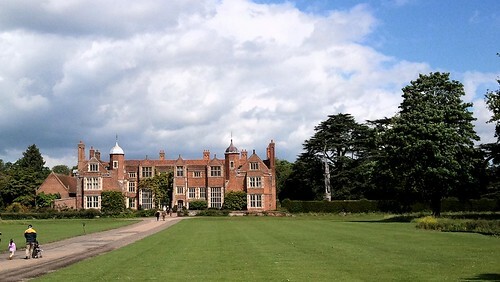 For now, though, let’s talk about Kentwell Hall. Last Sunday, I accompanied my landlady and her daughter to Kentwell Hall Through the Ages. Ordinarily this stately manor house has re-enactments from a single time period (often Tudor). For this weekend only, however, they put on re-enactments from across a six-hundred-year swathe of history. From medieval fletchers and farmers to World War II soldiers and 1970s campers, we got to see little slices of history come alive as we walked around the impressive grounds of this estate. For those of you familiar with Old Fort William, it’s much the same idea.